The girls were astounded when they heard that there was another craft and delighted when they found out that it was Shrink Art and they got to watch it shrink! This week's cupcake design was simple but fun! 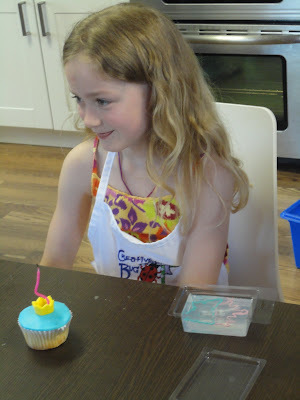 We put a quick layer of buttercream on then topped it with blue fondant and golden crowns. I have a lot more to tell this week...let's hope Blogger co-operates! I can't believe that my birthday was more than 2 weeks ago now! So crazy! I got some pretty sweet gifts though! My friends from Acts of Sweetness brought me some sweets! Sarah and Mr. CB chose this...even though Sean insisted I already had it. Mr. CB gave me this very same, very lovely book for Christmas. Oops! If you haven't met Bakerella, go give her some love because she is awesome! Oh and this is from the BEST Mum ever! I know that this one will make The Happy Baker proud...do you SEE that pink hammer in there Erin? If you haven't bought Erin's book go do it! And don't forget to get copies for your mom and all your besties too! I didn't get a photo but Mr. CB also picked up a copy of Glee Season 1 for me! 'Cause we all need a little (well, maybe a LOT) of glee in our lives! Finally, here I am with Ken from Community Care...he was sweet enough to stop by our Grand Re-Opening. These are some of the wonderful toys we collected for the Birthday Room at Community Care West Niagara. I am very proud to be their partner and look forward to making some of their clients feel special on their birthdays! There were other crafts too but we didn't have time to catch those on camera! It was so nice to share our new space with some new friends! Let's start with chocolate...mmmm chocolate! I have had trouble with white spots showing up on my chocolate so I tempered my chocolate this time...I am no expert so I used a tutorial. It wasn't terribly difficult, check it out. Then I brushed my chocolate into my mini-muffin cups. I used silicone because it makes it easier to pop out later. I recommend doing this step at least twice (let set and apply another coat). I didn't and my cups were delicate...and the ratio was off (for me at least). Here is the fun part! Mix 1 cup of peanut butter with 1/2 cup icing sugar and 1 tsp of vanilla (I totally used my mixer but if you are looking for an arm workout...) I used a large tip and icing bag to fill up my mini-cups... Heat up your chocolate and cover! We were recently buying paint when my 2.5 year old son saw that there is a Sesame Street Paint Colour Book. Yep, it's true. They are selling paint to 2 year olds now. He insisted on bringing it home and then he had me read it to him. Seriously. There were little descriptions of each of the characters so at least there was something to work with. This opened the door for me to ask him who his favourite Sesame Street Character was and he replied by finding Elmo and pointing him out (he doesn't talk a lot). Then we discovered that our middle child who is 5.5 also likes Elmo best. Our oldest? She loves Abby Cadabby and Zoe ('cause they're girls!) 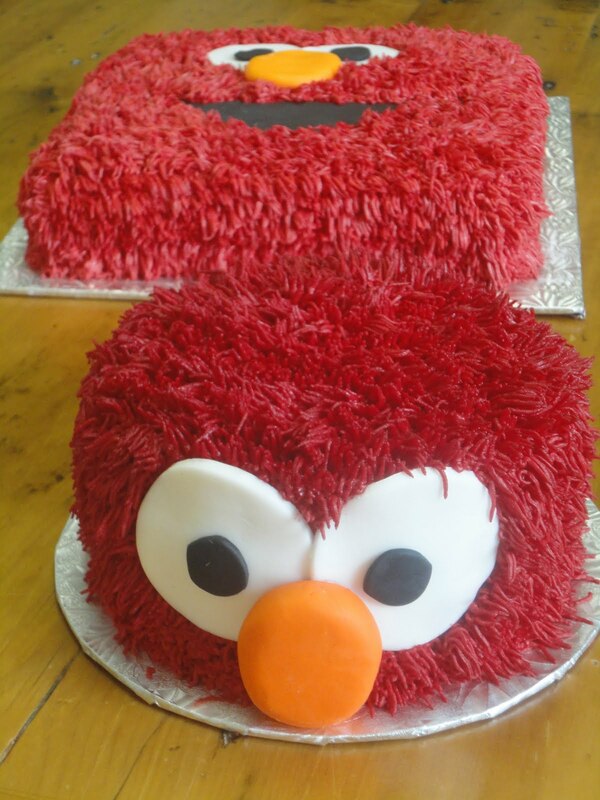 I have been a long time Elmo fan myself...I'm not so sure about the whole Elmo's World thing but I think he's pretty cute. 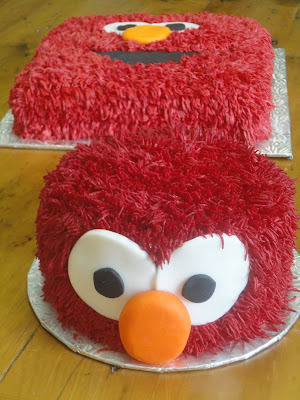 So when I was asked to do a couple of Elmo cakes for a friend, I was all over that! There is so much to see...I made the blinds myself with fabric purchased at Tonic Living, all the goodies were baked in my new kitchen! There were Cinnamon Roll Cupcakes, Lemon Cupcakes, Mocha Cupcakes, Mini Oreo Cheesecakes (I think these were the favourite! ), Oatmeal Nutmeg Scones, Buttertart Muffins and Almond Poppyseed Muffins. Yum! This is me with a representative with Community Care...we filled 2 baskets with donated toys! Fantastic! I will drop those off later this week for them to share with children in need in our area. We had more than 50 people join us for the event...we talked, enjoyed treats and did crafts! Everyone loved the Shrink Art! That is Grama CB sitting at the table with all of the kids. We couldn't have done it without her! Our special guests, The Acts of Sweetness Team! These ladies were so lovely, we are so happy they could join us for such a sweet occasion! Since the beginning of March our home has been turned upside down. 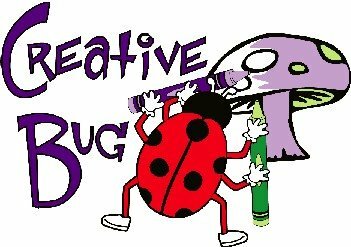 We are very pleased to welcome you into the brand new Creative Bug HQ! 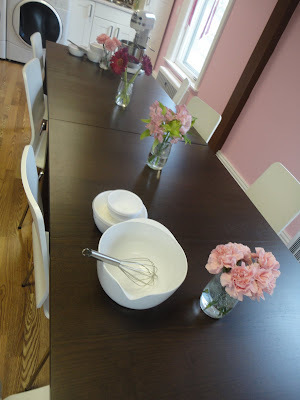 Please stop by on May 14th, 2-4pm for a treat, a craft, to visit with Redpath's Acts of Sweetness Team and to see this newly appointed, beautiful space!